While pre-sales of our retreat products may cover a portion of expenses, additional funding is needed to defray costs for meals, seminar time, event enhancements, lodging expenses, workshop tools and administrative costs. The generosity of local organizations & supporting individuals helps to keep our retreat attending costs affordable for those interested in starting their curl journey. Any unused sponsorship funds will be applied to next year's "City Curls Retreat". Although financial contributions are greatly appreciated, we are open to accepting bartered services as well. Full Page $75 Half Page $50 Quarter Page $25 Business Card Ad $15 Name Listing $5 Generosity Sponsorship (goes to next question) What Size Ad Would You Like? What Gift Bag Products Will You Provide? Your organization will receive an emailed list of agreed contact attendees. Your Organization will receive an "Upclose & Personal" One on One online Exclusive Interview for retreat promotion. Your organization will receive a gift basket of Retreat Promotional Products. Your organization will be acknowledged in any press releases, news or articles about The Au'Natural Queens Curl Retreat. Your organization’s logo will be played on a slide show before each workshop and group gathering. A representative *please keep to a minimum of 2* from your organization will be invited to speak with attendees about your organization during our retreat's group gathering for 30 minuets, preferably at the start and end of retreat. Your organization will be able to add their promotional items to our attendees retreat bags. Your organization representative(s) will receive one (1) complimentary over night room at this year's retreat. Your organization will receive a plaque recognizing your sponsorship of The Au'Natural Queens Curl Retreat. Your organization’s logo* will be included on printed and digital progrgrams, retreat materials & Backdrop. You will be mention in all radio ads, social media lives and interviews. Your organization’s logo will be played on a slide show before each workshop and group gathering at this year’s retreat. Organization’s Representative will have VIP Seating for the Dinner Show n' Boutique. Mention in the workshop ad book as vendor. Vendor shout out during Dinner Show n' Boutique via Girls with Curls Rock! Social Media Shout out once a week Starting May 1st 2019. A business card ad in the Program/Ad Book. Present 20-50 properly labeled product samples to our attendees with a request for product review. *products must be of hair and beauty related and must be properly sealed & labeled. 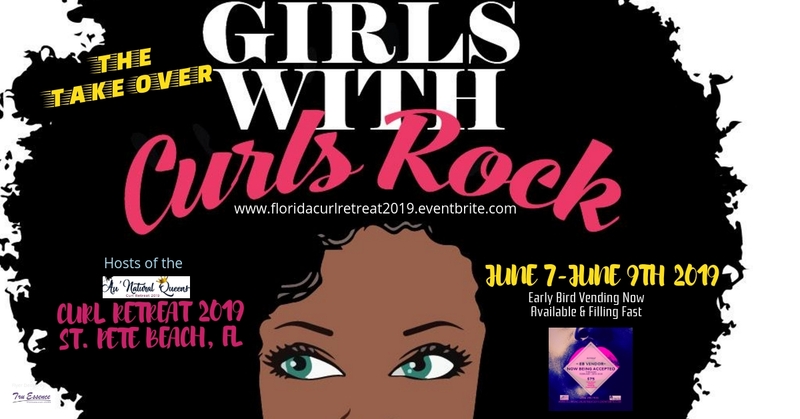 Receive certificate in recognizing your sponsorship of The Au'Natural Queens Curl Retreat 2019. Your Organizations name will be printed in the Program/Ad Book as In-Kind Sponsor. Your organization will receive a social media shout out recognition from our media team once a week before the retreat. Please describe your brand product. For sponsors promised logo recognition, the logo submission deadline is April 1st, 2019. If a logo is not submitted by the deadline, media committee will print the name of the sponsor in all materials. Please submit both a high-quality PNG or JPG image in addition to an AI or EPS file format (with all text converted to curves) to ensure your logo appears correctly on all necessary materials. The Curl Retreat Committee would like to know who to thank for the decision to sponsor our retreat. Please enter the name of the person we should address below.